Can you imagine a beautiful and well maintained garden, with neatly organised flower-beds and perfectly trimmed hedges and trees. Yes, this is not a part of some fairy tail, this can come true by our professional Gardening services. We from the Prompt Cleaners can turn your garden into the magical spot from the fairy tails only by ringing us. We will be there and make your garden come to new life. Prompt Cleaners always take care of my precious garden. I love my garden but usually I am too busy to take care of it. Thanks to Prompt Cleaners I can still enjoy my garden. Our Gardening services have been created after many years of experience and expertise of our professional team of gardeners. They have explored in details what is best for your greenery – plants, seeds and flowers will be delicately attended. All of you hedges will be perfectly trimmed, the threes as well, the grass will be freshly cutted and all the leaves will be collected. The whole place will be tidied up and put into order. And if there is some waste in the end, it can be taken away at your request, so that the whole place will look beautiful and well organised, with no signs of any disorder or dirt left. In the end there will be only the pleasant smell of the flowers and the freshness of the newly mowned lawn. You feel only the beauty and peace around you. Do not fear that the dream will be over. We can send you the gardener at your request once or even many times regularly, when you need us most. Or maybe you don’t have the garden and you would like to make this precious gift to your senses. You would like to enjoy the aroma and the pieceful tranquility of the nature. The Prompt Cleaners can help you once again. We can organise a free view for you at your site. Our Professional Gardeners will come on site and give you advices as to how this could be achieved. Afterwards they can help you choose your plants, or even buy them for you. They can level the ground, fertilize the soil, plant the flowers and as a whole help you with all your wishes and desires. You will see how with our professional gardening services your gardens springs for new life. You will wait no longer and you will enjoy the fruits of their expert and skilful efforts. Because what is more satisfying then to see how your dream garden blossoms in front of your eyes. So do not hesitate to contact us, we are here for you 7 days a week and can send you out team of professional gardeners when it is most suitable for you. They will arrive fully equipped and eager to help you. 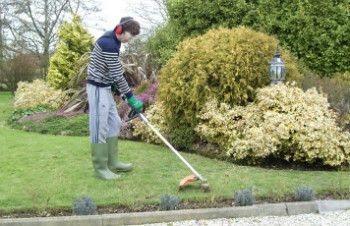 They will work expertly, efficiently and promptly and turn your garden into the one you have dreamed of.